This is a 1oz Bottle of Z-7 CA Glue Debonder from Pacer. Debonding agent for all CA glues. Will not craze most plastics. Works by softening the glue so it can be wiped away. Removes glue from fingers and most surfaces. 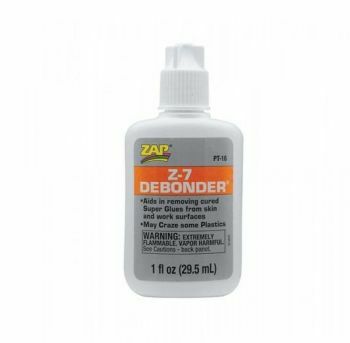 One 1oz Bottle of Z-7 CA Glue Debonder.